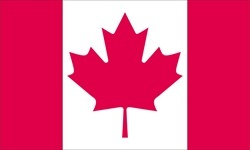 Canada’s flag became the official flag of Canada of February 15th. It wasn’t until that day that Canada had an official flag for their country. Prior to that the British flag or union Jack had been flown in Canada and the Red Ensign served as an unofficial flag for Canada until 1924. In 1964 the government began to search for a new flag and the House of Commons began accepting submissions, and by October 1964 a unanimous voted adopted the first official Canadian Flag. The colors of red and white displayed on the flag are the national colours of Canada by king George the V. in 1921. The white on the flag stands for peace and honesty and the red means bravery and strength. Until the flag was made official the maple leaf did not have a status as a national symbol. Although it was an important symbol to Canadians ever since the aboriginal people began to use maple sap and it was even used to decorate for the visit of the Prince of Wales in 1860.